This is a handmade piece. The idea here is a low budget storage unit that does not intrude on the space between the wheelhousings. This organizer takes advantage of the underutilized space above and in front of the passenger side rear wheel. The legnth is 30", 11" of which is in front of the wheel and 19" on top of it. The interior width is 7 1/4". Overall height is 14" which keeps it below the tonneau cover. The height of the inner shelf is 8" which makes it lay directly on the top of the wheelhousing. I used 1/2" pine plywood for the two sides and the top, 3/4" pine for the front, back, bottom and inside shelf. I purchased 3 yards of carpeting at a local automotive parts store for $10. The carpeting is mounted using a can of spray type adhesive. The color does not match the interior exactly but still looks good, great considering the price. I did find trunk carpeting at a local stereo installers shop which would match the factory color very close but for the price it was not worth it for my purposes. It was $10 a yard and would have to be special ordered requiring a 5 yard minimum purchase. Add shipping and tax and the carpeting bill alone would total $70+. The organizer is mounted securely in place yet not permanently. Two screw eyes are positioned on the box in unobtrusive locations. One on the upper back, and one on the front portion of the bottom. The rear screw eye is cable tied to the rear seatback latch, and the front screw eye to the cargo tie down. If I need to access the factory rear quarter panel storage area, I just cut the front cable tie. A1 Hinged Top 20.00" 8.25" 0.50"
I rely on a 2.5 pound Halotron Fire Extinguisher for fire saftey. This was purchased from Fire End Corporation. I chose the Chief Croker Halotron I model # A385TS with vehicle mounting bracket. 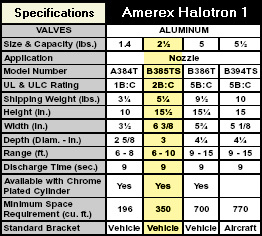 It is made by Amerex, using Halotron-1 which is manufactured by American Pacific Corporation. Halotron-1 is environmentally acceptable, meets EPA approval and is the government approved and specified clean agent alternative intended to replace Halon. It is ideal for protecting office computer areas, data storage, telecommunications and high tech clean rooms. Halotron-1 is a clean agent fire extinguishing system that is electrically nonconducting, volatile, or gaseous and does not leave a residue upon evaporation. Basically it is great for automotive applications. The extinguisher comes with a sturdy mounting bracket which I mounted to my cargo organizer.